Nous avons passé 2 semaines très agréables dans cette grande maison située dans les hauteurs de Castries avec vue sur le port et la mer. La villa est très bien équipée et nous avons énormément apprécié l'accueil réservé par Cathy à notre arrivée. Wonderful house in an unforgettable location. 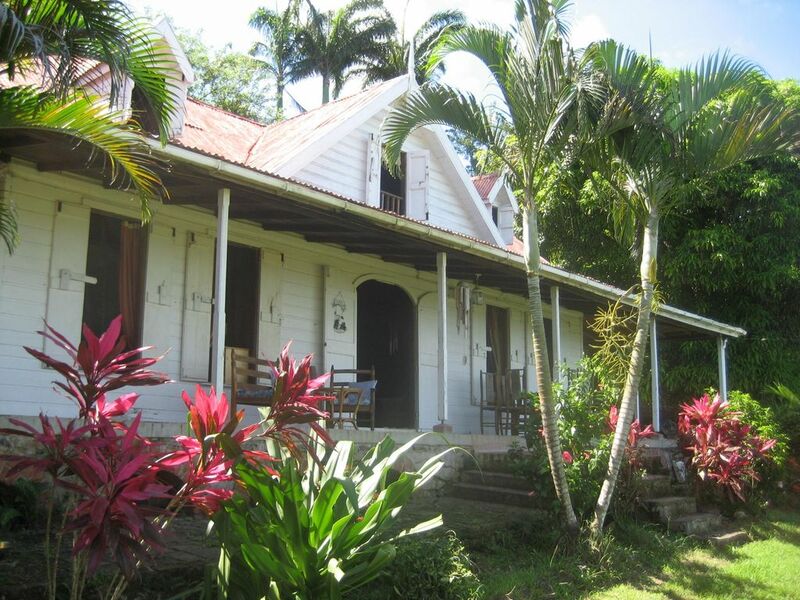 Living in this old St Lucian house was, for four weeks, an experience we will never forget. It’s historical character was both quirky and above all comfortable providing a real feel of the Caribbean, which is so sadly lacking in modern day apartments and hotels. The view from the veranda overlooking Castries and the sea beyond, was both amazing and unforgettable. The house was very well equipped for everyday living complete with barbecue and fresh oranges from the garden...what more could one want! Cathy and Jacques were the perfect hosts who could not do enough for us. We had two fantastic meals at their water front restaurant... highly recommended. The boy can cook!! Other local restaurants, the Pink Plantation and the Coalpot, are also very much worth a visit. As the house is located off the beaten track a 4x4 /SUV vehicle is a must. Although we hired our own through Islander cars (who were excellent) Cathy was very helpful in providing us with information on local car hire companies. Overall the holiday was first class and highly recommended. It was a pleasure to have you stay with us. We love to see people enjoy the house and garden as much as we do. I love your description of the house, it certainly is unusual and gives visitors an authentic feel for life in the Caribbean before concrete took over. Hands down, this was one of the loveliest places I've ever stayed and we can't wait to return! Cathy, our host, was friendly and helpful - available when we needed her while giving us privacy at the same time. She helped us arrange a boat trip with snorkeling at deserted beaches and deep sea fishing with Rabbit (ask for him, he's amazing! ), and treated us extremely well when we dined at their waterfront restaurant, Jacques (which we also recommend!) The house had amazing views and we spent many hours relaxing on the veranda, looking out over the water, listening to the neighbor's music vying with the insects. We had daily visits from Maya, the German Shepherd, and she brought a smile to our faces every time she stopped by while exploring. The property is lovely, with many different fruit trees and flowers in blossom. You can tell this home has been well loved and the structure itself is absolutely gorgeous with dark wood and trade wind breezes blowing through. We found it was the perfect place to come home to after zip-lining, climbing Gros Piton, hiking and snorkeling at Pigeon Island, and visiting the market in Castries. We loved our daily walks through the surrounding neighborhood and found the Pink Plantation house was a nice place to have lunch. We really can't recommend this home enough and are already anticipating our next visit! We chose Mango Plantation for our recent stay in St Lucia. Its a lovely, authentic old plantation house, and was perfect for our needs. The house offered all we needed for our stay, and the garden and surroundings were perfect for relaxing and enjoying the sunshine (and humming birds). As others have mentioned, access to the house is not straight forward, the roads are quite challenging, and a 4x4 is strongly recommended, although we just about managed with the normal car that the hire company delivered. The trip to Soufrieres is well worth making, and Pigeon Island was also good. Castries itself is a little disappointing, but the market offers fresh fruit and veg, and there is a supermarket next to the market for other provisions. Cathy is a good host, and made sure that our arrival went smoothly, and was on hand for advice and help on what to see and do. She also kindly gave us a guided tour of the local surroundings, which was a massive help for us finding our way around. We had the pleasure to stay at Mango plantation last January. We were 3 couples, staying for a week, looking for tranquility and peace far away from our busy lives in France. The location of the house on top of the hill, overviewing the beautiful bay of Sainte Lucie, surrounding by the nature made our stay fantastic. Isolated from the rest of the world, we had the most relaxing time. Cathy, the owner, is a beautiful person, always responding to our questions, despite the fact she is a very busy woman, she took very good care of us all, she was so helpful and always with a smile. We just loved being in their House. Please note that the above rates are inclusive of two people, extra adults are charged a USD 20.00 per person per night to cover linen utilities and cleaning and children under 12 are USD 8.00 per day, children under 5 yrs are free of charge. We can arrange extra children's beds or cots in the parents' room on request. Our usual change over day is Sunday although we can be flexible depending on other bookings. Extra nights are charged on a pro-rata basis, the length of rental periods are not limited. Special rates are available for medical students doing internship at the nearby Victoria hospital, proof of internship will be required.